Cooked in a slow cooker, this deluxe meat and potato dinner takes comfort food to the next level. Pat short ribs dry with paper towel. Rub with 2 tsp beef base and pepper. Heat oil and butter in large skillet set over medium heat; in batches, brown short ribs for 8 to 10 minutes or until browned all over. Place in slow cooker. Add 2 cups water and remaining beef base to skillet; bring to boil, scraping up brown bits from bottom of skillet. Pour over short ribs. Add onion, celery, carrot and garlic to slow cooker. In small bowl, whisk together balsamic vinegar and flour until smooth. Whisk in plum tomatoes, tomato paste, brown sugar and oregano. Stir into slow cooker. Add bay leaves. Cover and cook on Low for 6 to 8 hours or High for 3 to 4 hours, or until short ribs are very tender. Remove bay leaves. Meanwhile, in large saucepan of boiling salted water, cook celeriac and potatoes for 15 to 20 minutes or until tender. Drain well; return to saucepan set over low heat. Add cream and butter; mash until smooth. Season with salt, pepper, nutmeg and cayenne. Stir together basil, oil, lemon zest, garlic and salt. 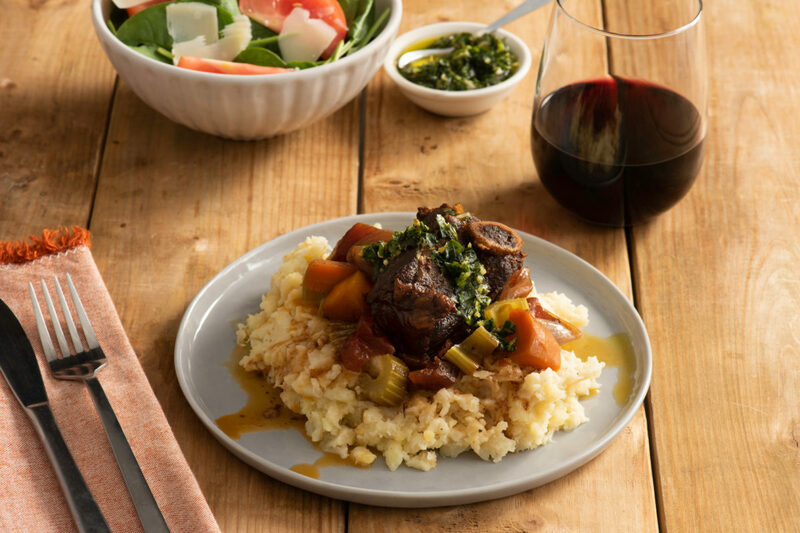 Serve short ribs over celeriac mash with a drizzle of gremolata. Tip: Versatile celeriac or celery root can be eaten boiled, roasted or raw in salads. To prepare, cut off the top and bottom of root and stand on flat side of cutting board. Slice downwards to remove all the knobby, brown skin for a smooth mash.